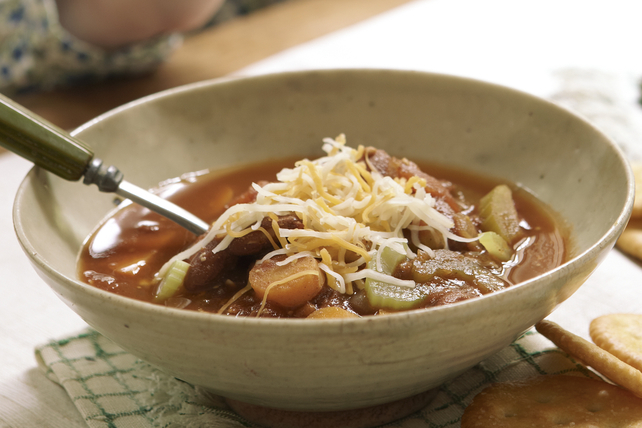 This soup is brimming with vegetables and great Southwest flavour. Bring all ingredients except cheese to boil in medium saucepan. Simmer on low heat 25 min. or until vegetables are tender. Stir in 1/3 cup cheese. Ladle into bowls. Top with remaining cheese. Garnish each serving with a dollop of sour cream and sprinkle of fresh cilantro just before serving. Use any variety of beans you prefer, such as black beans, cannellini beans or chickpeas (garbanzo beans). Enjoy your soup with Premium Plus Crackers. The carrots in this cheesy soup provide an excellent source of vitamin A.